Lynn Tomasek, Chief Administration Officer at Brothers Plumbing, Heating & Electric joins the ranks of many men and women who have been recognized by Trademark Who’s Who. Denver plumbers at Brothers Plumbing, Heating & Electric have been providing excellent service for over 30 years. Lynn Tomasek, Chief Administration Officer, Brothers Plumbing, Heating & Electric, has been recognized by Trademark Who’s Who for showing dedication, leadership and excellence in the plumbing industry. Lynn Tomasek has dedicated the past 14 years of her career to corporate administration. At Brother’s Plumbing Heating & Electric, Lynn has been able to forge a culture of compassion that truly sets her business a part. Providing world class customer service, every experience with Brothers Plumbing is one that leaves clients fully satisfied. Lynn Tomasek will join the likes of many professional men and women who also have achieved great success in the forthcoming 2014-2015 edition. 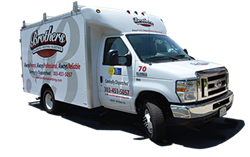 For more information about Brother’s Plumbing, Heating & Electric visit their website. With expert members representing every major industry, Trademark Who’s Who is the trusted resource and historic tool that facilitates the creation of new business relationships in all areas of business. Following the same tradition of the now more than 100 year old concept, Trademark Who’s Who prides itself on preserving the stories of each member as each of them deserve his and her own place in history. The talented professionals profiled in the historic registry share such virtues as determination, courage, patience and discipline. It is not these characteristics which set them apart from the rest of us, but their extremely high degree of accomplishment. Now more than ever these people serve as an example, each if these extraordinary people documented in this book offer tangible evidence of the value of hard work, goal setting and passion. Trademark Who’s Who membership provides these hardworking men and women with a certified and validated third-party endorsement of their accomplishments, and serves as a way to spread the word about themselves through a trusted network of individuals brought together by the same common morals, values, and dedication. The history preservation of one’s family legacy and personal achievements is also a driving force in the success of this publication. Such a well-researched and verified source ensures this tool to act as a bridge forging long lasting new business relationships. To learn more about the services being provided by Brothers Plumbing including sewer repair in Denver, drain cleaning, water heater repair and replacement or heating and electrical please give them a call at (303) 451-5057. Brothers provides a “Happy Today Or You Don’t Pay” guarantee.